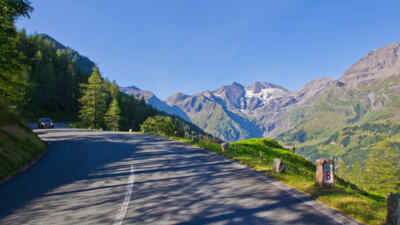 Find out about prices and opening hours of the Grossglockner High Alpine Road prior to your arrival and select the ticket that best suits the trip of your choice: day ticket with extension option for a second day, 30-dayticket, season ticket, round tour ticket or tour ticket for motorcyclists. Use the discounts you can get at the automobile associations ÖAMTC, ARBÖ and ADAC, and drive an electric vehicle for a particularly cheap price (tickets for this discount can only be obtained at the pay desks)! Tip: comfortably buy your ticket at home online! Visitors of the Grossglockner High Alpine Road can now be guided by a completely new multimedia guide - quite simply via app on the smartphone. The virtual guide gives a deep insight into the nature and tells exciting historical facts. More information in our Blog! 1) The day ticket for cars is reduced to EUR 26.50 and for motorcycles to EUR 20,00 for trips after 6.00 p.m..
2) Round trip tickets are valid for one trip on the Grossglockner High Alpine Road and one trip on the Felbertauern Road within 30 days. 3) The return trip on the same day is free of charge (every vehicle). 4) This ticket for the 3-Country National Park Tour includes use of the Grossglockner High Alpine Road, the Felbertauern Road and the admission of a family (max. 2 adults and 2 children) to the National Park Center in Mittersill within 30 days. 6) Season tickets are valid from the first day of the season until winter closing, but not later than 31 December of the year issued. Season tickets can only be purchased for private vehicles (not for company cars, taxis and rental cars or other commercial uses). Classification is determined by vehicle registration certificate only (Austrian Terms for Vehicle Use 01). 7) Valid during the same calendar year in which the ticket was presented for the first trip, non-transferable and linked to the license plate of the vehicle. 8) The special TOUR ticket includes a day ticket for the Grossglockner, Gerlos and Nockalm Road and entitles the holder to a reduced ticket for the Villach Alpine Road (EUR 8.50 instead of EUR 11.50). Available for EUR 37.50 at the individual cashpoints and in advance for EUR 33.50 at ÖAMTC, ARBÖ and ADAC offices. 9) From 10 vehicles (car / motorcycle) you get a group rate. Simply post at the point of sale. A driver (organizer) pays for the group. More information in our brochure.